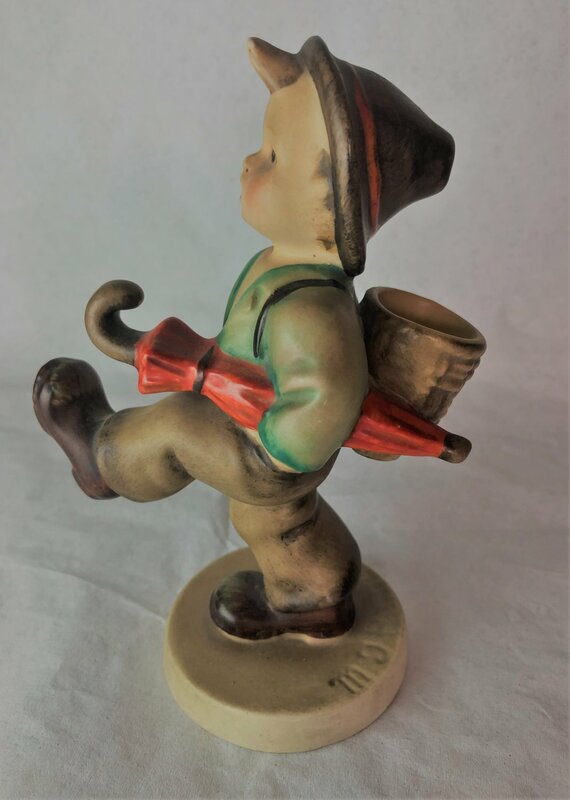 RARE HUMMEL Figurine Globe Trotter #79 TMK1 U.S. Zone Germany 1946-1948 5.25"
> Upper base is incised "M.I. Hummel"
> Underside is stamped "U.S. Zone GERMANY" and incised with a "79" for the mold number, and what appears on close inspection to be the "arm" of the "W" portion of the incised Crown trademark (TMK1), near the "U" of "U.S. Zone"
> Painter's markings on the underside read "30" and "2/9"
> Note: Due to the barely discernible trademark, we researched this piece extensively, and believe it to be genuine. The "U.S. Zone GERMANY" mark dates the piece to just after World War II, 1946-1948, which was within the TMK1 period. The piece has details found in TMK1 period Globe Trotter molds that were changed in later versions. Later versions have a single-weave basket (not the double-weave of this one), a black umbrella handle (not the light brown of this one), flatter hair shape at the brow line (versus the pointy hair of this one), and more well-defined ears. Globe Trotter is sometimes confused with "Happy Traveler" HUM 109, which is a similar boy with umbrella but with no basket at all. CONDITION: Color and condition are excellent. No chips, breaks, cracks or repairs whatsoever. Ships worldwide. If shipping cost to your location is not shown, please contact seller for a shipping quote and invoice for your purchase.